Welcome back! This is my third post for today. Here is my Penny Black card post and Winnie & Walter Day #2 release post. This is the first time I have used Memory Box stamp sets. I cannot believe I don’t have a Memory Box stamp set. But that is because I didn’t know they made stamp sets! Of course I have their dies. Their dies are absolutely beautiful and intricate. And stamp sets are so adorable. 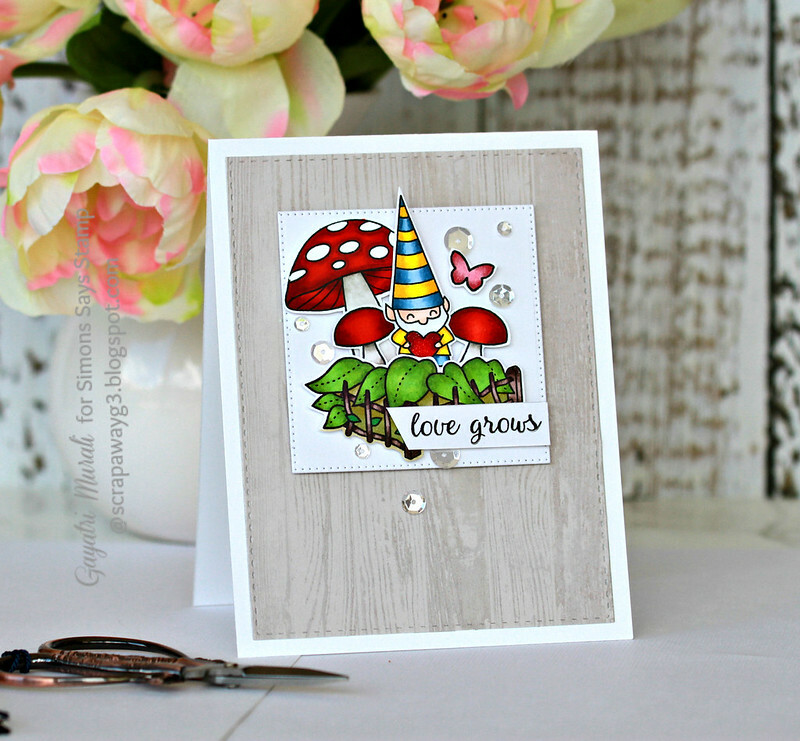 I particularly loved LOVE GROWS stamps set with its cute gnomes and toadstool and accessories. I enjoyed colouring these images to make my card. I stamped and copic coloured the image from Love Grows stamp set. Then hand cut them out. I then die cut a small square panel using Pinpoint Square die from Pinpoint Square die set from Memory Box. On this panel, I made a cluster scene using the cut out coloured images. I adhered them using glue and foam adhesives to achieve various die mention. I stamped the sentiment also from the stamp set on a strip of white cardstock, trimmed and adhered. This panel is adhered on a Stitched Rectangle (from Simon Says Stamp) panel die cut using My Mind’s Eye Woodgrain paper which is adhered to the card front. Finally added some of the beautiful Sparkly Clear sequins from Pretty Pink Posh. Gorgeous design and I love your BOLD use of color, Gayatri! Fabulous!! Amazing coloring and layering, Gayatri!! The images sure come to life! 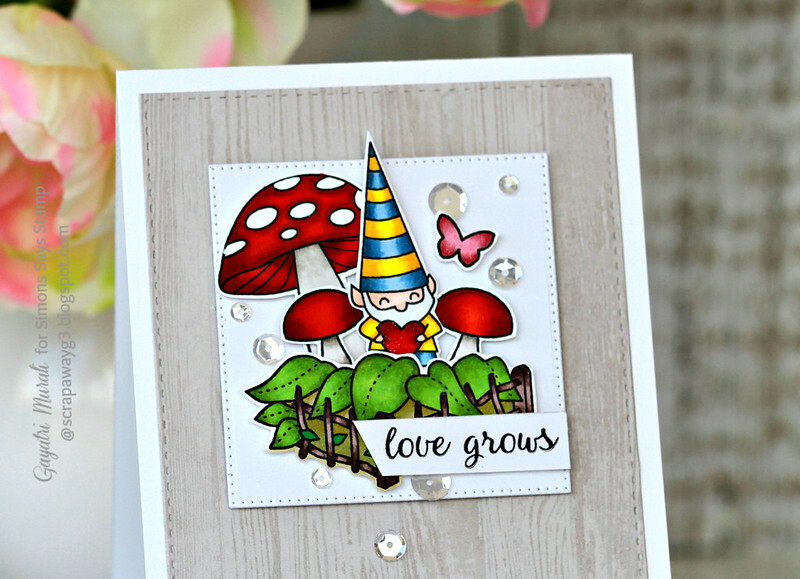 A gorgeous card Gayatri, I love the adorable cute gnome tending is super garden and what huge mushrooms!!! I love the brilliant colouring!! Adorable card Gayatri! Such a cute image!! Such an adorable card!! Love it! This is amazing! What beautiful coloring! You really made this set shine, Gayatri! Absolutely adorable! Such cute card ! Absolutly love the coloring you made ! Love how you coloured these images Gayatri – great effect!